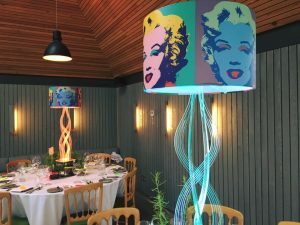 We provide custom-made lampshades for a totally unique Table Centre! If you’d like to promote your brand, company logo or a specific theme at a Corporate Event or Private Party, we can personalise our table centres to help you achieve this. Bespoke table centres to fit with a Pop Art theme for a corporate party. 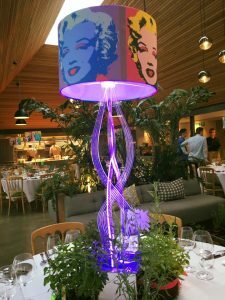 Check out how we personalised our illuminated LED Samba Swirl Lampstand to fit with the Pop Art theme of this Corporate Event. 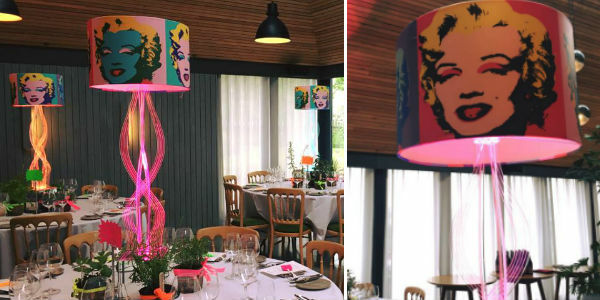 This table centre design incorporates Andy Warhol’s infamous Marilyn Monroe print, as we felt this symbolised the Pop Art era very memorably. It was something that the guests instantly recognised and associated with this theme. Our elegant Samba Swirl Lampstand is a perfect combination with this lampshade. It can be illuminated via our wireless LED lighting, which can also be DMX controlled if you wish. A remote control is also supplied so that you can control the colour of each table centre with ease throughout the event. 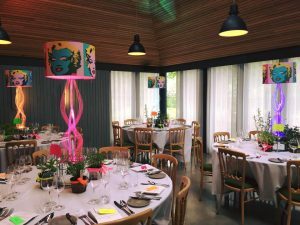 The end result is a fun and eye-catching centre piece, which enhances the theme of this Corporate Event and adds a stunning focal point to every table.